Chief’s Council president Fortune Charumbira has mocked local prophets for failing to predict the devastating Cyclone Idai which, according to the International Organisation for Migration, claimed over 560 lives in Chimanimani and Chipinge two weeks ago. Charumbira, who is also a senator made the remarks last week after Local Government minister July Moyo issued a ministerial statement updating legislators on the devastation caused by the weather phenomenon. He questioned the prophets’ capacity to foretell future events, particularly natural disasters. Although government insists that the death toll stands at 179 people with at least 329 missing, humanitarian agencies involved in the rescue and retrieval operations in Manicaland province, said the death toll could rise sharply as more bodies are believed to be buried in rubble. “This issue before us is very difficult because no one knew about it and someone said to me that the prophets we have – why did they not tell us? How do they prophesy because here they did not see that people were going to die? 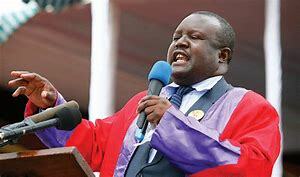 The issue is that the prophets that we have — their capacity is now questionable,” Charumbira said. Moyo told the House that agricultural infrastructure in Chimanimani was severely damaged, adding that this will impact negatively on people’s livelihoods. Chimanimani is well known for producing export quality macadamia nuts, tea, coffee and fruits. “Agricultural infrastructure has been damaged extensively. Some of the infrastructure is related to horticulture, for instance. Chimanimani is where we have macadamia nuts and most of our tea there has been damaged. The infrastructure of small-scale vendors and others has been destroyed, and we now need to focus on livelihoods of the people,” Moyo said. The Local Government Minister said while Zimbabweans donated tremendously, the food items were short of foodstuffs for children and babies thus placing their nutrition in danger. “The amount of support of food, medicines and clothes is tremendous. What we are now appealing for is food items for children and babies. When we did our inventory, we found out that there were not too many people who were actually making sure that children and babies are catered for and that has started coming after we made that appeal. “The damage to infrastructure has been extensive, but the damage that has occurred to individuals, families, children, adults and women has been very intense. The epicentre of that Cyclone was in Chimanimani East constituency,” Moyo said. Masvingo senator Josiah Hungwe said while people were donating immensely to the affected areas, there were many foodstuffs but no cooking utensils. “How are they going to cook the food because I did not see any pots there; even water buckets or cooking sticks (utensils). My worry is how are they going to cook the food…? The firewood was even wet,” Hungwe said. Further commenting on the cyclone, Moyo told Senate that government was now looking at redesigning settlements.